Changing our stories to #redrawthebalance. Katrina Encanto, Katrina is a Senior Creative at MullenLowe London. She is an advocate of #redrawthebalance. Why representation matters now more than ever. This is a phrase that we often hear when we talk to people about #redrawthebalance, a campaign that raises awareness about gender bias ingrained at a young age and the need for visible female role models. As a female creative in an industry where women make only 29% of creative departments, I don’t agree that this problem has gone away. Feminism has certainly made a comeback in recent years, appearing everywhere from Superbowl adverts to sweaters on the high street, so much so that “feminism fatigue” has become a term people use to shut out talk about gender inequality. Truth be told, women’s voices need to be heard more than ever, because equality still seems to be the exception rather than the rule. In the past year, we’ve seen leaders elected despite their clear disdain for women, sending out powerful statements of what is deemed to be acceptable in society. Women are still perceived to be “weaker, smaller and less intelligent” than men — at least MEP Korwin-Mikke seems to think so. According to the World Health Organization, 1 in 3 women all over the world still experience physical and sexual abuse in their lifetime. And if the idea of 170 years to close the pay gap wasn’t grim enough, the World Economic Forum now reports that the disparity continues to widen. A lot of this can be traced back to the lack of representation for women, both in our stories and in real life. If we take a closer look at all the stories we’ve seen and continue to see in books, ads, TV shows, films or the news, and the lack of female voices in them, it is no surprise that notions of women being less valuable, still exist. It is demeaning for any woman to feel like her voice isn’t being represented, but just to frame how important this is, we need to think about the young minds that are being formed based on these distorted views of society. Media can play a powerful role in shaping children’s interests and ambitions early in life, and influencing decisions of what they become as adults. It has also become an accessible place for children to find role models they can relate to, which is especially important when they are spending more time watching TV than at school. When gender stereotypes are defined between 5 to 7 years of age, these stories can become concrete proof to challenge them. The problem is, gender bias is prevalent in media as much as it is in real life. According to the Geena Davis Institute of Gender in Media, when it comes to family films, male characters hold 81% of the jobs and they outnumber female characters 3 to 1. In the documentary Missrepresentation, Geena Davis reveals that between 1937 to 2005, there were only 13 female lead characters in animation films. All of them, apart from one, sought romance. When the majority of our stories portray women as sidekicks or damsels in distress, what message does that give of what women can achieve? It is for all these reasons that our team at MullenLowe London, in partnership with the charity Inspiring Girls International, came up with a second campaign for #redrawthebalance. We wanted to focus on getting better representation on screen so both girls and boys can understand that women are just as capable of becoming heroes of our stories. The campaign launched with a film about an animator getting animated about gender inequality, revealing the fact that only 29% of characters in animated films are women. 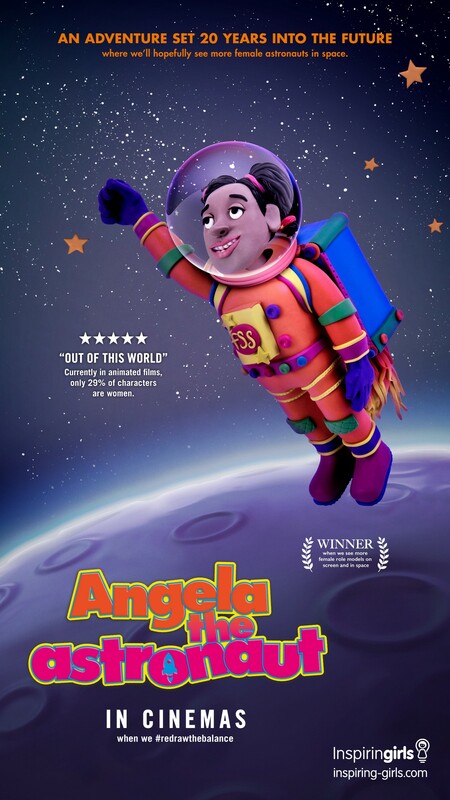 In support of this, we worked with four female illustrators from the UK, Spain, Brazil, and the Philippines, to create movie posters featuring characters that we don’t see in children’s films: Angela the Astronaut, Cathy the Carpenter, Sally the Scientist and Carla the Coder. An almost entirely female team, including the animator, illustrators, editor, director, sound designers and musicians, created the campaign. To quote Rebecca Solnit, “who is heard and who is not defines the status quo”. We need to ensure that females are represented in the stories that are reaching children all over the world. For animation studios, this means having more than 20% female creators behind the scenes so that we can have more authentic stories told through a female lens. To illustrators, animators and other fellow creators, let’s bring hidden stories of amazing women into the limelight or create the characters that don’t exist. And to everyone who believes in the power of stories to inspire our children, let’s make our voices heard on why we need to redraw this balance.